The past week has been absolutely beautiful with hours of sunshine and no rain! The towns in Summit County are extremely busy and visitors are hitting the trails the enjoy the fantastic weather! Inventory is continuing to increase throughout Summit County and new listings are going under contract very quickly! Last week, 21 residential properties sold, this is slightly lower than the number of sales last week. The highest residential sale last week was for a 5 bedroom / 3 bathroom, single family home located in the Tenderfoot Addition to Dillon Subdivision in Dillon. This 3,391 square foot home sold for $819,000. 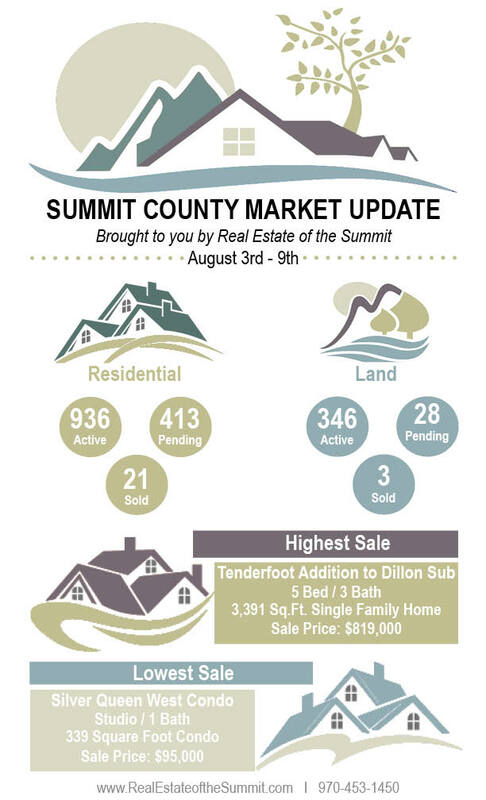 Enjoy the Summit County weekly real estate report below brought to you by your mountain real estate professionals at Real Estate of the Summit.